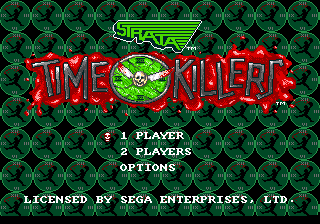 Time Killers is an action game originally released in arcades in 1992. It was brought to the Sega Mega Drive in 1996 by Black Pearl. It is a versus fighting game, starring characters from throughout history. THQ were working on a port as early as 1993, with a release originally planned for January 1994, however the game was significantly delayed for unknown reasons. Main article: Time Killers/Magazine articles.